This useful mute holder attatches onto a music stand to ensure your mutes are always at arms length. A brass players must-have gadget. Fits most trumpet, cornet, trombone and french horn mutes. Holds 4 mutes of differing shapes and sizes. Packs down small and easily attatches to most music stands. 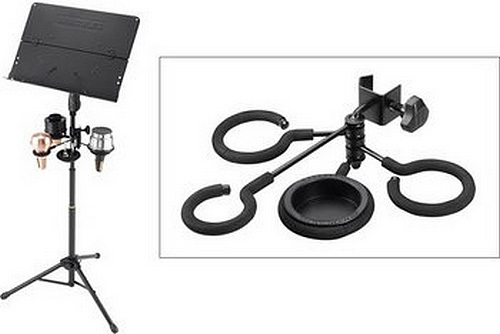 270 degrees of ring swivel to provide your ideal set up. Rings are covered with foam to eliminate noise. Didn't get Hercules Mute Holder, got K&M one instead. £5 cheaper but no offer of refund for money paid for Hercules one despite two queries raised.